As the awareness and expense of environmental issues increase, and raw material costs march ever higher, Designing for Disassembly is receiving a lot of airplay as a “green” and cost-savings approach that responsible companies are adopting to better control their products’ end-of-life stage. In a sense, this step completes what has mainly been an incomplete process. In general, traditional in-house product design has concentrated on getting products into a customer’s hands. The important factors were the aesthetic function, cost, manufacturing, packaging, shipping, and display of the product. What happened to the product in its afterlife was left to others: the waste collectors, material recyclers, antique dealers, and garage tinkerers. However, with the current economic conditions and level of eco-awareness, the value and environmental cost of these “dead” products are now being recognized, assessed, and quantified. So rather than leave their products’ ultimate demise to chance, some companies are designing an intentional end-of-life phase. Strategies to accomplish this take multiple forms, each with its own set of benefits and challenges. But regardless of the specific strategy, each must have a well-defined purpose. What is the end-goal of the disassembly strategy? Is it to repurpose components, reclaim usable parts for refurbishment, or make materials recycling easier? Repurposing, taking an existing component and using it unchanged in another product, can be the most straightforward approach. A good example of this is GM’s goal of finding non-automotive uses for the Chevrolet Volt’s lithium batteries when their performance drops below the car’s functional requirements. When this happens, the batteries can no longer power an automobile, but they still have usable life: in some estimates, up to 70 percent of the original charge. One application GM is investigating is bundling the batteries and creating backup power systems for homes. From the reports, the Volt batteries themselves will not have to be modified to serve this new function. They will merely require removal from the Volt and shipment to an assembly operation to be integrated into the new product. From the standpoint of labor and organization, reclamation for refurbishment is usually more complicated than repurposing. In order to mine usable components from damaged, non-functioning, or simply discarded products, the products need to be disassembled, and the individual components tested, sorted, and stored. For any given component, recycling centers conduct time studies to establish the return on the time investment needed to accomplish these steps. Markets exist for these components and sub-assemblies, functional or not. Some recycling centers will even create refurbished product themselves, assembling end products from their inventory of working components. In all of these cases, parts that would have once ended up in a landfill now have a new life. Materials recycling is generally the most familiar form of reuse, and ideally can be the most basic. 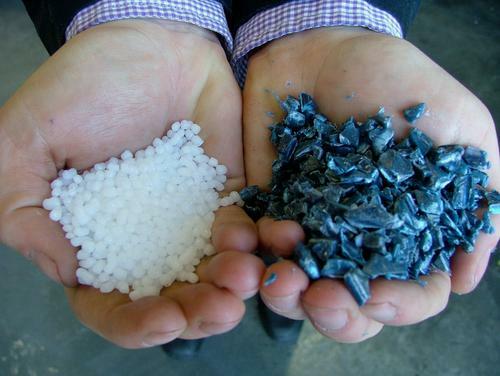 In the simplest terms, products are separated by material type, which are then reprocessed into usable raw materials. While the purposes behind these end-of-life strategies seem straightforward and simple, it does not take a lot to make their implementation messy, costly, and financially untenable.